Our new thin LED Strings are the thinnest LED (only 4mm wide) lights in the market and very flexable to use in almost any application. 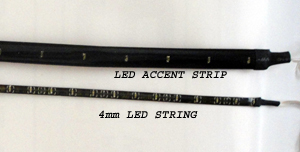 Our kit comes with 8 pieces, 4-12" and 4-8" long strings with maximium LEDs imbedded to make them the brightest strip made. 3M 2 way adhesive and long 4' lead wires make for versitle instsllations. Work on anything 12 volt, with or without a battery.